Songs of Eretz Poetry Review is pleased to present “Almost Unbearable” by Carol Hamilton, Poet of the Month. Ms. Hamilton will also be serving as the guest judge for the Songs of Eretz Poetry Award Contest, which will run from September 1 to October 15, 2015. A detailed biography of Ms. Hamilton may be found here: http://eretzsongs.blogspot.com/2015/08/songs-of-eretz-poetry-review-poet-of.html. The contest guidelines may be previewed here: http://eretzsongs.blogspot.com/p/songs-of-eretz.html. when love is ripped off. on the cusp of nothingness. Poet’s Notes: There are always the stories of loss of paradise, as well, of loss of love for lack of faith, loss of the abundance of the year. The poem is scattered on the page as our histories of gain and loss are scattered about throughout our lives. We must share all the stories. This is not necessarily a neat and tidy thing. Editor’s Note: I enjoy the way this poem comes full circle, with the allusion to the mythical Orpheus in the first stanza and the direct reference to it in the last. 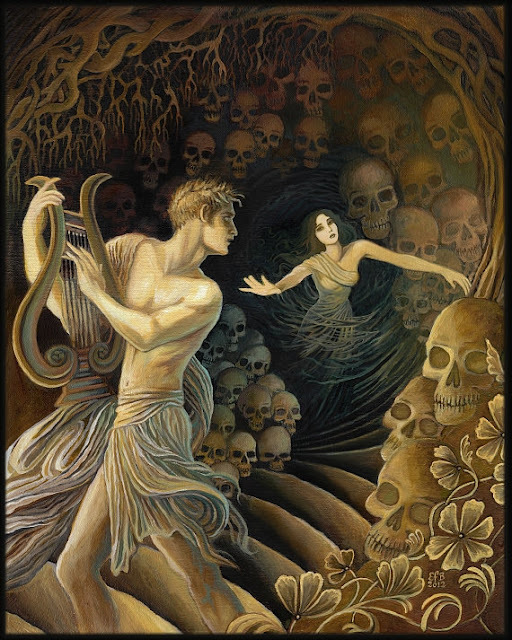 A nice summary of the myths surrounding Orpheus may be found here: http://www.mythweb.com/encyc/entries/orpheus.html.